This is our new weight bench, which makes work more effective, as well as adds strength and tone to the entire abdominal section. With ample padding and heavy duty steel construction, our sit up board provides stability for simple exercise and is ideal for you to more easily emphasize lower abdominal muscles and build the abs you want in less time. Welcome! High quality with competitive price can be realized here! 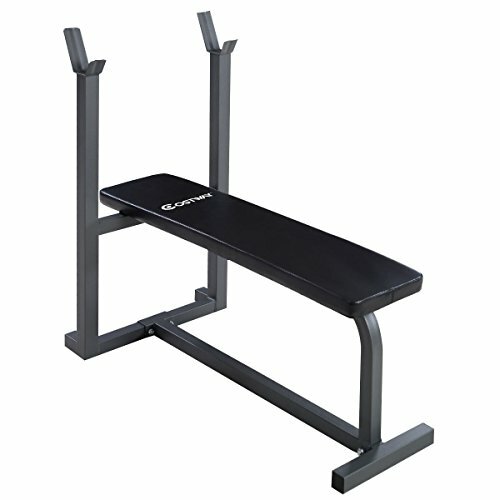 [Multifunctional] Freestanding flat bench offers wide variety of core workouts, it perform sit ups, twists and so on. [Sturdy and Durable] The bench is made of thick and endurance steel frame, sturdy and ideal for a variety of barbell and dumbbell exercise. [Multiple Places Use] Ideal for commercial, light institutional and home use without taking up too much space. [Size Information] Weight Capacity: 440 lbs. Size of the pad: 43.3" x 9.8"(L x W). Pad Thickness: 1.6''. [Easy assembly] Come with an instruction, easy to assemble.